A lot of interesting things have happened in the world of motherboards recently. The advent of SATA 6Gbps means our storage needs will have all the bandwidth they’ll need for at least a little while. USB 3.0 means our flash drives can join in on the bandwidth fun as well. 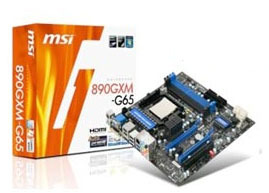 It’s no surprise that a company like MSI decided to incorporate both of these new technologies into their new AMD based motherboard, the 890GXM-G65. This new board will also support AMD’s brand new 6-core Thuban processors, all while packaged in a small Micro-ATX shell. [url=http://creative-web-media.com]creation sites web[/url] – design web.